Unless you preordered Wolfenstein: The New Order or conned your way into the Doom closed beta by other means, you're probably keen to get your hands on it. Thankfully there's an open beta kicking off later this week – April 15, to be precise – and you won't need a code to play it. The new trailer above celebrates this fact while also showcasing all the death, violence and horror the game proudly flaunts. 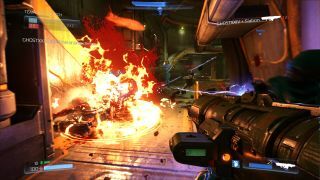 The beta runs until April 17, leaving id Software a couple of weeks to make some tweaks before the game's May 13 release. A bunch of us have already had some time with the game, and the reception has been mixed so far: the UK team had their concerns, while Evan focused more specifically on the weapons.